It seems we're awash in vampires these days, in everything from movies, television shows, and novels to role-playing games, rock bands, and breakfast cereals. But what accounts for their enduring popular appeal? 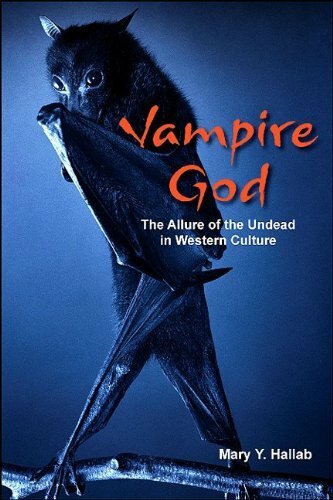 In Vampire God, Mary Y. Hallab examines the mythic figure of the vampire from its origins in early Greek and Slavic folklore, its transformation by Romantics like Byron, Le Fanu, and Stoker, and its diverse representations in present-day popular culture. The allure of the vampire, Hallab argues, lies in its persistent undeadness, its refusal to accept its mortal destiny of death and decay. Vampires appeal to our fear of dying and our hope for immortality, and as a focus for our doubts and speculations, vampire literature offers answers to many of our most urgent questions about the meaning of death, the nature of the human soul, and its possible survival after bodily dissolution. Clearly written, with wry humor, Vampire God is a thoroughly researched, ambitious study that draws on cultural, anthropological, and religious perspectives to explore the significance and function of the vampire in relation to the scientific, social, psychological, and religious beliefs of its time and place.